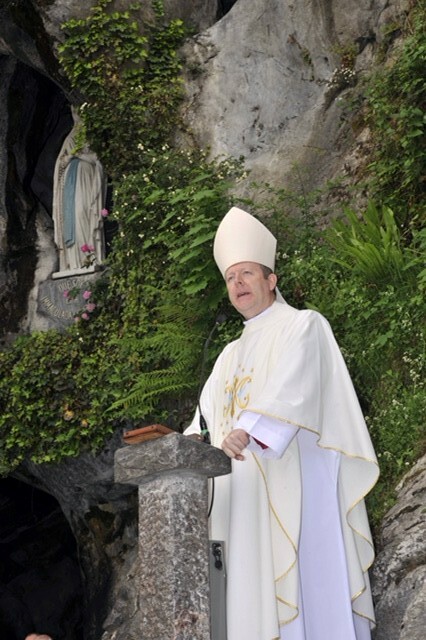 My dear brothers and sisters, here we are, many miles from home, gathered in the foothills of the Pyrenees at the beautiful grotto in Lourdes. There is something very special about this place. No wonder millions of people have come here in procession, and hundreds of thousands have returned again and again. And yet, if it wasn’t for Mary’s appearances here 157 years ago, most of us wouldn’t even have heard of Lourdes, never mind travelled here. And it is the same with the other places our Blessed Mother chose to visit – they were not the grand squares of the world’s great cities, the splendour of royal palaces or the bustling centres of learning or civilisation; they were often the remote and isolated places, like lonely Lourdes, forgotten Fatima or the windswept Irish hillside hamlet of Knock. Neither did Mary choose to appear to great thinkers or theologians, powerful politicians or rich and influential business people. Her chosen ones were the little people of the world who knew the struggles of living with nothing except their trust in God and his providence – people like young and innocent Bernadette who couldn’t read or write, or the down-to-earth parishioners at Knock, or the little shepherd children of Fatima: Lucia, Francisco and Jacinta. Today, on the Feast of Our Lady of Fatima we are linked through prayer with the hundreds of thousands of pilgrims who are gathering at Fatima to celebrate the feast. Down the centuries Mary’s chosen hosts must have wondered, like Elizabeth: How is it that we should have been honoured by a visit from the mother of our Lord? But I like to think that, in appearing, Mary was fulfilling the dying wishes of Jesus, when he entrusted her to be the mother of all the living: ‘Woman, behold your Son’. And at the same time, Mary’s apparitions encourage us to remember that Jesus also said from the cross: ‘Son, behold your mother’, and that our heavenly mother is there for us when we need her help. Why have you come to Lourdes this year? Do you come in joy and hope, in sickness or worry? Is it out of deep devotion, or perhaps curious questioning? Have you come here to ask Mary’s help and intercession, or to thank her for favours already granted? I know that we all carry with us, in our heartfelt thoughts and prayers, the petitions and needs of so many others, family, friends, loved ones, neighbours. Perhaps this morning you are thinking about someone who has asked you to pray for them at Lourdes: perhaps a child, brother, sister who is sick or worried, maybe a friend who is depressed or weighed down by anxiety, a neighbour who has been bereaved recently, a parent who has tragically lost their son or daughter, or a couple struggling with their marriage or family. Perhaps you are thinking about a young person who is taking exams, or a friend or relation who is looking for work. Maybe you or someone you know is struggling with some problem or addiction, a sinful habit, an important decision or a tense relationship. Whatever our reason for coming to Lourdes, we should not be afraid to be drawn to Mary’s gaze and comforting arms, because as the Memorare prayer puts it: ‘never has it been known that anyone who fled to her protection, implored her help, or sought her intercession was left unaided by her’. Neither should we be surprised if Mary asks something of us here at Lourdes. Remember she was the one who gave herself totally to God’s will at the Annunciation, and at Cana she said: ‘Do whatever he tells you’. A common theme from her apparitions around the world has been the call to conversion, to do penance, and to make reparation. Her messages are often direct and challenging. ‘Penance, penance, penance’, she told Bernadette, and her final words to the children of Fatima were: ‘People must amend their lives, ask pardon for their sins, and not offend Our Lord any more for he has been already too greatly offended’. My dear brothers and sisters, our pilgrimage to Lourdes will call us to change, and to deep inner healing of mind, body and Spirit, for ourselves, our families and loved ones, for our countries and for the world. In praying for this conversion and healing, we need not be afraid, for Mary our Mother is there to protect us. It was on this day, 13 May, back in 1981 that her ‘unseen hand’ shielded Pope Saint John Paul II from almost certain death in Saint Peter’s square. Today, 13 May 2015, Mary is ready to shield us too, from dangers in our lives, from fears and anxieties, and from the snares and attacks of sin and evil on our spirit. I would like to ask you to remember a special intention with me this year at Lourdes. In the coming days the people of Ireland will be asked to vote in a referendum which will change the meaning of marriage and family in the Constitution of Ireland. The Bishops of Ireland are clear that they cannot support this amendment and they have asked the people of Ireland to reflect and pray very carefully before voting. I know that many people in Ireland and around the world are beginning a novena today, or praying the Rosary, or fasting and doing penance for the special intention of marriage and the family. In his message for World Communications Day this coming Sunday, Pope Francis describes the family as a ‘privileged place of encounter with the gift of love’. The Holy Father says, ‘families, at their best, actively communicate by their witness the beauty and the richness of the relationship between man and woman, and between parents and children’. So when we pray for, and speak up for the institution of marriage as it has been understood across cultures and down the ages, we are not trying to hurt or offend anyone – thank God, in His great mercy He loves all of us equally, and so should we. We simply want to respect the dignity of difference between male and female. We want to protect and promote the uniqueness of that special relationship between a wife, a husband and their children which is sanctified by Our Creator, endorsed by Jesus, and which is such a powerful and prophetic beacon of hope for society. O Mary, Mother of all men and women, and of all peoples, you who know all our sufferings and our hopes, you who have a mother’s awareness of all the struggles between good and evil, between light and darkness, which afflict the modern world, accept the cry which we, moved by the Holy Spirit, address directly to your Heart. Embrace us with the love of the Mother and Handmaid of the Lord, and this human world of ours, which we entrust and consecrate to you, for we are full of concern for the earthly and eternal destiny of individuals and peoples. “We have recourse to your protection, holy Mother of God!’ Despise not our petitions in our necessities”. Our Lady of Lourdes; Fatima; Knock; pray for us.